“I want my kids to be immersed in REAL Mexican culture”…and “San Miguel has just so many ex-pats”; “it’s not ‘authentic’ enough…”. I can’t tell you how many times I have heard comments like these. My children and I are currently on a six-month stay in San Miguel de Allende, Mexico and before it’s done, we will have been here an entire year. Needless to say, my response to these sorts of comments has definitely done a 180°. Admittedly, I WAS one of those people. I was a skeptic. I wanted a real, ‘authentic’ experience for my family. I wanted us to speak Spanish and make Mexican friends. Despite my concerns, convenience brought us here. Upon moving to a lovely house near the park, I even called my husband to tell him that I would never live here again because it was ‘little America.’ Most of our neighbors were ex-pats who spoke English! While I still understand those concerns, I now have a new perspective. For one, I realized that before beginning any journey priorities need to be established …what is your goal for this adventure? Are you travelling for fun or relaxation? For culture? Language? To see a new world? Live differently? What do you want to get out of your immersion trip? Back in Los Angeles, California, our quality of life is pretty high. Or course the cost of living is also high, but it’s safe to say that our family enjoys all of the amenities of a cosmopolitan city in a First World Nation. Target and Ikea keep us stocked in commerce, and sky’s the limit for the range of activities and opportunities available so long as you can a) navigate the traffic, and b) pay for them. So, as much as I wanted my children to ONLY speak Spanish when we came here, and only socialize with Mexicans, I now realize that those superficial standards were keeping us from forming stronger natural relationships. It was only once I let go of those preconceived specifications that our real immersion started and we transformed from being tourists to travelers. The truth is that my children most related to other kids from a similar socio-economic background, and they were not the kids in the campo initially. (C’mon, how could I expect a few kids from LA to instantly bond with kids who lived with chicken coops inside their house?! Life seemed so instantly different at that point!) With the kids that they naturally gravitated toward, they shared similar interests, quickly recognized their commonalities, and formed bonds. 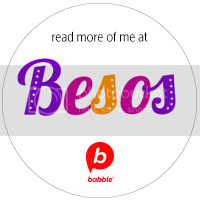 And it was this form of peer interaction that was the greatest motivating factor for them to learn Spanish. The more language they acquired, the more they reaped the benefits, and they went from simply being included in games of tag to learning the nuances of telling a joke that doesn’t translate. But then, an even more interesting thing happened… As they sufficiently mastered the language, the door opened to my so-called ‘authentic’ experience. They spoke the language of all of the kids in Mexico now. So now, their comfort zone grew, and they formed relationships across socio-economic backgrounds. Afterall, don’t all 8-year-old boys have some interest in the spy/ninja world? Or fútbol, at least? And don’t most little girls enjoy a twirl in a tulle skirt? As an anthropologist, we often discussed the now debunk term “Noble Savage” as it was used to describe Native Americans by scholarly Western folk. “Noble Savage” refers to an idealized concept of an uncivilized person and his/her pure goodness that has not been corrupted by the influences of modern civilization. It’s easy to dismiss that notion in an academic setting, because it is obviously patronizing and lacks acknowledgement of variable cultural values. However, that is exactly the same idea as me wanting my children to be immersed in some antiquated idea I have of Mexico… in a rural setting, playing with sticks. If the “savage” is someone who does not have all of the modern amenities or conform to modern standards of living, then savages can be found as easily in the United States as in Mexico and around the world. This has nothing to do with culture or language, but has everything to do with inequitable opportunities, the persistence of poverty without adequate resources, and sometimes traditions. I did not and do not want my children associating Spanish and Mexican culture with poverty or a lack of resources any more than I would want them associating the South (U.S.) with bigotry and hatred. The two exist, of course, but they are not bound by transitive properties and are not true for all peoples. The Spanish language is a rich and live language, the second most spoken language in the WORLD (after Mandarin Chinese). And the Mexican culture is equally as rich and vibrant, passionate, broad, historied, and detailed. THAT is the Spanish and the culture that I want my children to know. The purpose of our trip, our living here, is to expose them to an equally rich, advanced, and sophisticated culture and language as they have at home, to offer them a different perspective. I try to avoid value judgments as to which is better, but I know that HOW they are exposed and how they FEEL about their experiences will color their opinions and their association with Spanish and the culture. I don’t want to confuse the language and culture with systemic infrastructural problems in the country that dictate how potable water is, for example. The point is that it takes times to form relationships, authentically; they cannot be fabricated for an ‘experience’, and it is exactly those relationships, once formed, that drive language learning. It’s an emotional need to connect (watch out: they say it’s most easily done between lovers!). It’s funny that children seem to know this truth intrinsically, while some adults still think it’s a malleable concept. San Miguel de Allende is a sophisticated and cosmopolitan city set in Spanish colonial architecture with cobblestone streets. It is a Mexican city with a large population of ex-patriots from around the world. It is also a city with a storied and proud history, but one that has accepted gentrification with grace. When I finally embraced the realities of living here is when, I’d argue, our real cultural and linguistic assimilation took place. At that point, we were able to build organic relationships with people and the community. We made friends because of mutual interests and with mutual affection, not because we were ‘Americans’ and they were ‘Mexicans’ or ‘Swedes’ or ‘Italians’ or whatever, but just because we liked one another. But it’s been easier to do that when we share a common language. Last weekend, we spent the morning swimming with friends: Americans who gave birth and are raising their children in Mexico. The ten kids played tag on a beautiful and expansive property in a smattering of English with peppered Spanish. 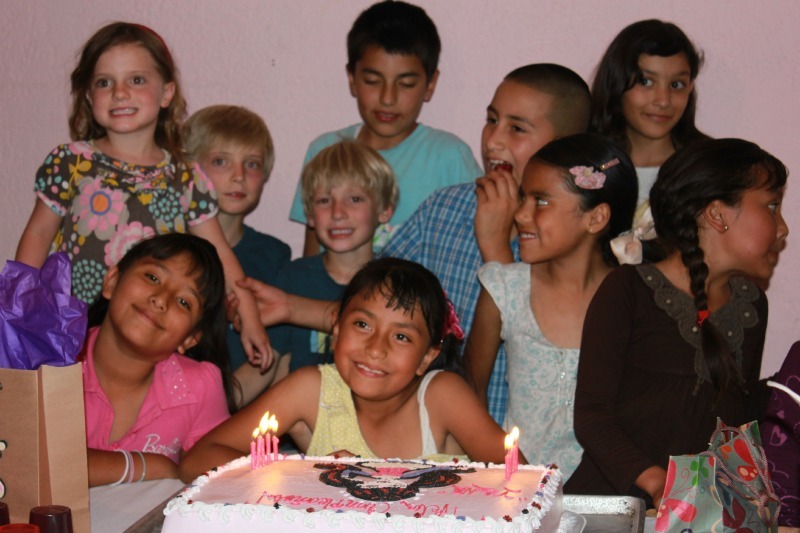 That afternoon we attended a birthday party on the outskirts of town where we were the only Westerners that some guests had ever talked to. To look at us, we stuck out like sore thumbs with blond hair, sunburnt skin, freckles, and light eyes. But to listen… there was no difference. The kids played, ate cake, helped each other onto the brincolin (trampoline), and hit the piñata. 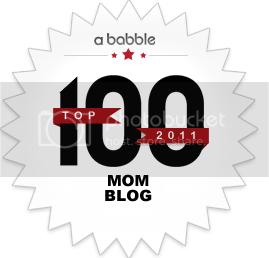 The mamás talked about our families and acknowledged the normalcy of children throwing tantrums and eating too much sugar. 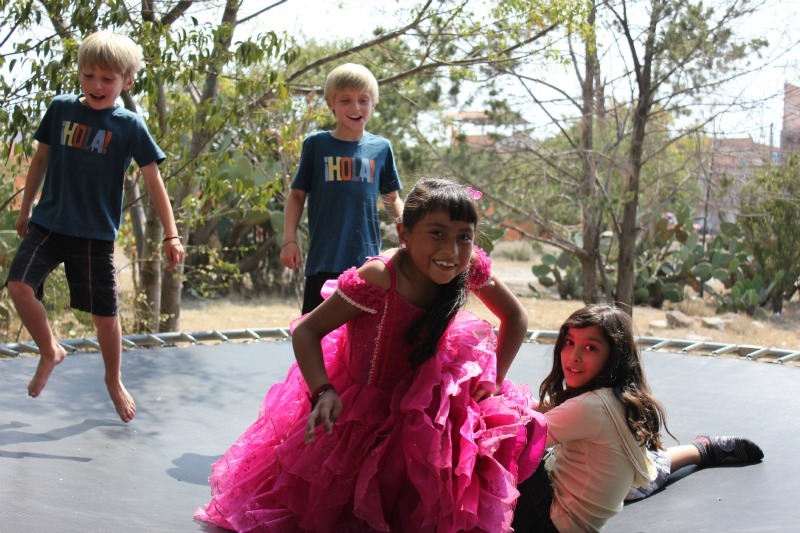 The socio-economic difference between the two gatherings was plain: one might be painted as a more real Mexico, and the other as a result of gentrification, but there was no distinction made by the kids who were at each place simply to play with friends. 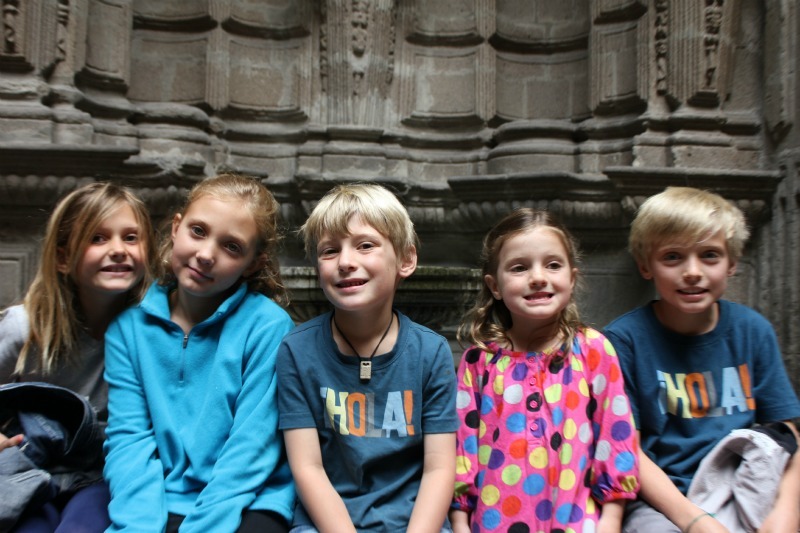 I like that my children do not see a difference in their quality of life between Los Angeles and San Miguel de Allende. I like that the friends they’ve made here would be the same friends they’d make at home. They play with the same toys, discussing items of similar interest — in Spanish, sometimes English, and all the time in ‘kidspeak’, that universal language that kids share to communicate. The idea of the Nobel Savage, or an unsophisticated being that is somehow more pure, is ridiculous – neither were they unsophisticated, nor more pure. But the idea that we, as outsiders, judge the purity of an experience based on external factors, such as country vs. city living, or how many foreigners live in a native country, is equally as ridiculous. The real Mexico cannot be boxed into any one stereotype; the real Mexico is a dynamic country with a passionate past and a thriving future. It certainly depends on your goals, but I don’t think it matters where you choose to study Spanish or immerse yourself in a culture, so long as the intentions are pure. And when in doubt, just follow your kids – they’re always a beacon of purity. What a fantastic analysis on all dimensions! I loved reading your entries and following everyone’s adventuras! Thanks so much, Elizabeth! I have to admit that it’s a bit complicated… but worth it’s weight in gold ten fold!! Thanks for the encouragement… abrazos! 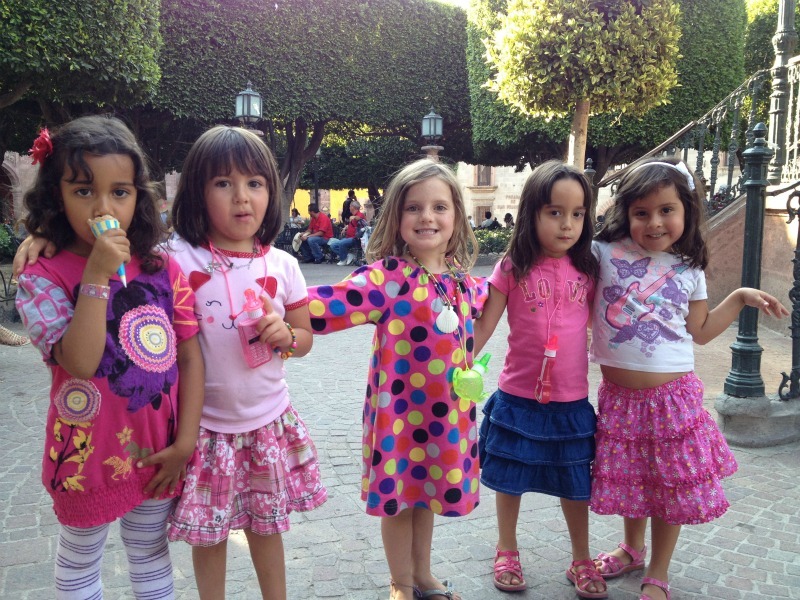 What a great opportunity to take your kids to San Miguel Allende to get the real immersion experience. Mexico is so rich in colors, flavors and wonderful people, thank you for sharing! ooh, you are right, Xochitl! Mexico is SO rich in all of those things, and we have been so fortunate to meet such special people here. Even when we return home, I suspect we’ll keep up with many of our friendships made here and spend time together again – in Mexico, in Los Angeles, or wherever in the world. I feel really lucky. A most interesting read. It’s great to see the adaptation of your children reveal the great benefits of their linguistic and cultural experience. I’ve travelled Mexico extensively and the concept of the “noble savage” is significant. To a certain degree, the tourist industry spawns the creation of a cultural commodity of sorts where tourists expect a particular cultural product (whether through music, language, or “culture”) to meet their expectations. When this is not met, their is a sense of inauthenticity. However, I think you are correct in making the distinction that you were a traveler and that you recognized your experience as authentic despite the surroundings not initially meeting your expectations. So I commend the evolution of your perspective. Your piece also reminded me of the minority vs. language issue in bilingualism. My wife and I use the ml@H method precisely because we understand that Spanish is the minority language for us, despite us living here in Southern California. 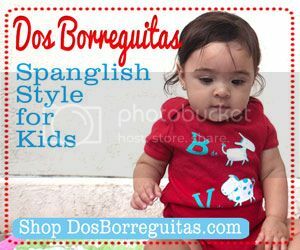 To nurture a genuine bilingualism for our children, we recognize we have to front load on the Spanish now to then hopefully later allow it to “survive” once English is introduced as we know it will clearly be the dominant language for our children as a result of environmental factors – media, friends, school, everything…. So we in a sense are taking a delayed bilingualism approach. The point is that we guard our children from English at this point in their life because we understand the seed to Speaking language, reading, and thinking in Spanish (proficiently at least) requires a strong beginning. In your case, things were inverted. You were in a Spanish dominant environment, despite your English speaking neighbors and contacts. As a matter of fact, my wife and I on occasion discuss that if we lived in Mexico, Spain or another Spanish speaking country we would actually speak English at home to keep a balance precisely because Spanish would be the dominant language – media, schools, etc… Your experience to a great degree seems to validate our method and approach to language acquisition. Thank you for sharing.